Eric is a young and experienced coach with 9 years of coaching experience and still an active Wexford adult team player. He has successfully attained his Provincial B Ontario Soccer Association certification. 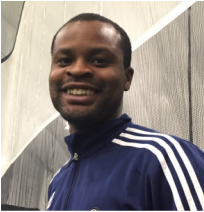 Besides coaching at CFA he is active as Scarborough Soccer Association District Selection Assistant Coach, Peel/Halton District Selection Staff Coach, Wexford S.C. U-10/U-9 Elite Development Coach. Previous experience include: Wexford S.C. U-13/U-12 Coach, East York U-21 Head Coach and Cedarbrae CI Head Coach. Eric values the development of individuals on and off the field of play, working with players to achieve their various goals. His philosophy includes an approach that focuses on healthy mind and body through sport.